Just when you thought this crazy Vuelta couldn’t get any more exciting, it did. Tom Dumoulin‘s Herculean and persistent effort on the day’s final ascent saw him constantly on the offensive until the final few metres, surprising the more noted climbers to take a well-deserved stage win and reclaim the leader’s red jersey which he’d last worn on stage six. The day’s undulating stage took in the Costa Blanca coastline and, like yesterday, delivered a sting in the tail with a finishing circuit which included two climbs of Alto de Puig, the second one going all the way to the summit. The peloton screamed into the final ascent at around 80kph, with teams jostling for position and race leader Esteban Chavez well positioned at the base of the steep 4km climb. After a couple of initial moves by Alejandro Valverde, Dumoulin attacked with 2km to go, swiftly followed by Nairo Quintana. As the other contenders clawed their way back into contention, Dumoulin went again then, after a counter-attack by Fabio Aru, yet again. Rafal Majka set off in hot pursuit, joined by Chris Froome and Joaquim Rodriguez as they bridged across to Dumoulin. Rodriguez attacked, only to be overhauled by Froome, bidding for stage glory to silence the doubters. But Dumoulin dug deep, launching one final effort to secure victory and reclaim the race lead. To be fair, Dumoulin had given everyone fair warning at the start of today’s stage. While Dumoulin is the obvious candidate, I’m going to award it to a rider who was equally dogged in his pursuit of points towards the King of the Mountains jersey. 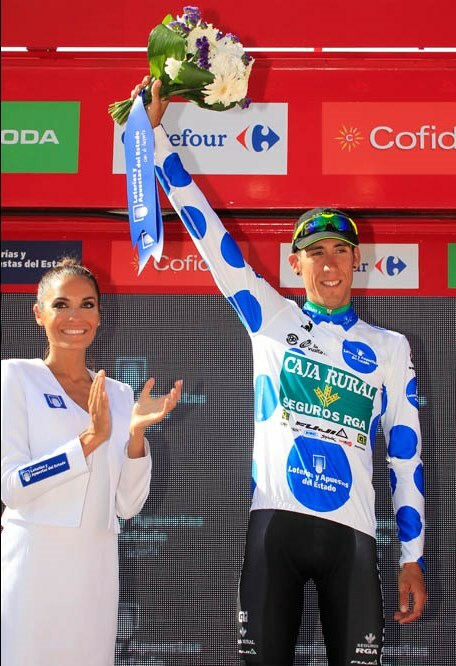 Step forward Caja Rural’s Omar Fraile, who got into the 14-man break specifically to hoover up the five points on offer at the top of the first ascent of the Alto de Puig. He was initially distanced but managed to get back up first to Yohan Bagot (Cofidis) before pressing on and taking both Pieter Serry (Etixx-Quick Step) and Mattia Cattaneo (Lampre-Merida) a few metres from the summit to the appreciative roar of the Spanish crowd. He now leads that competition by five points ahead of Dumoulin and Bert Jan Lindeman. Expect to see him in further breaks. 1. #BelterofaVuelta. Isn’t it just? Largely because the race isn’t following the usual script. New faces have really shaken this race up and while they may fade in the final week, they’ve shown us that the future of cycling is in great hands. 2. All shook up. We wondered when it was going to happen but today the GC favourites came out of their blocks and raced. The overall is starting to take a familiar shape and, despite losing time a few days ago, Chris Froome today showed the type of form that could see him become the first British rider to take the Tour-Vuelta double. Note that four Sky riders finished in the top 20 today. Of course, he wasn’t the only one who came out to play. Rodriguez, Aru, Majka and Movistarlets Valverde and Quintana also made their presence count. One of the best final hill stages. Wasn’it it just! Real edge of the seat stuff.